Here's another app privacy problem you might have to worry about: Apps that have access to location information on your iPhone or iPad can access, copy and steal your entire iPhone library without you even knowing. Watch your pictures! 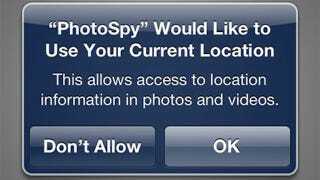 The way it works, according to the NY Times, is that when apps ask for permission to access location information, it also gains access to an iPhone's photo library. Though the app never has to specify that it has access to your photos, it does. And if it's malicious, the app could upload your personal photos to a server offsite.